When “Scout,” a 9-year-old German Shepherd mix, walked into the WSU Veterinary Teaching Hospital, he went to work right away. Calm and obedient with friendly eyes and a large scar across the top of his head, he lies down on the mat his owner, Anne Hensley, puts down for him. She kisses his head, and he watches her as she sits down. Scout is a therapy dog. “I was a civilian volunteer in Vietnam,” said Anne, who continues to suffer from post-traumatic stress disorder. She has also recently been diagnosed with Parkinson’s disease. “Just having him there is essential for my mental, emotional and physical health,” said Hensley, who has lived with Scout for the past 7 years in a retirement community. 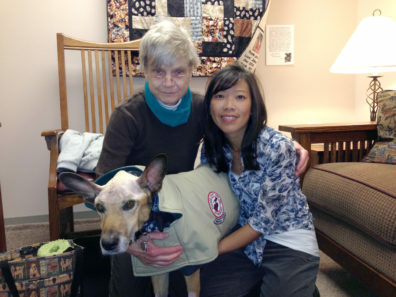 Scout, a rescue dog, was paired with Anne through a dog assistance program. Scout keeps her going. He is life, she says. Back at home in Tacoma in August 2013, Scout started having intense seizures about once a week. “The seizures were very intense, very intense,” said Anne. “Because animals serve as a model for diseases in humans, the knowledge from the trial could also one day help humans,” said Dr. Chen. “There was a lot of anxious time,” said Anne. In a chance encounter, Anne met Nikki Hessner, a junior at WSU and member of the WSU Raptor Club. Nikki was walking through the Veterinary Teaching Hospital with “Kessie,” a resident American Kestrel when Anne came up and began asking questions. “She just kept asking questions and we never ran out of things to say,” said Nikki. Today, Scout is almost back to his old self. He is able to continue his important job as a therapy dog and can do everything he could do before surgery. Scout also went three months before having another seizure, and this time it was very mild. Update: In November 2015, Scout passed away, but he and Anne enjoyed two wonderful years together after his diagnosis.